Working with yarn in lots of different ways keeps crafting fresh for me. 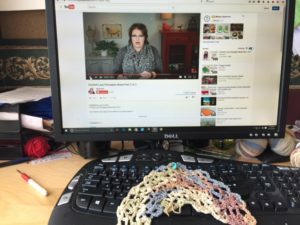 I was inspired to make Marly Bird’s “Lacy Pineapple Shawl” when I saw her wearing it at Stitches South, and when she made a YouTube tutorial for the pattern that was a clear sign to go for it. I went up to my stash and chose Classic Elite Summer Sox, which I really bought for my daughter to use, but she wasn’t interested. 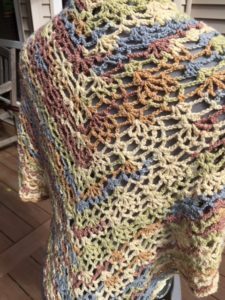 Looked good for a summer shawl, to me. Every time I crochet, I enjoy it. 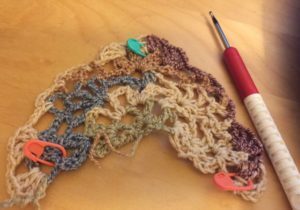 I like being able to try on the project while working on it, as the stitches are not all contained on a knitting needle. I like the wrist action, and how fast the project moves along. I like how I can have great big holes in the lace, but when something gets caught in one the fabric is strong and doesn’t break or pull threads loose. This was a fast, fun project. Almost too fast, as I was really enjoying myself. I’m already planning to make at least one more – these would be great gifts, and I have a lot of sock yarn in stash :). I’m going to get back to Agate Ripples first, though. And then, there are napkins on the loom to weave. So many lovely projects to make, so little time! 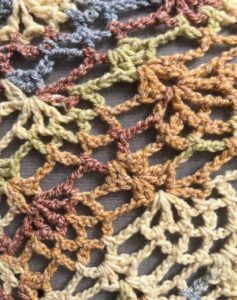 Grab some stash yarn, check out Marly’s video tutorial, and give this great design a whirl. 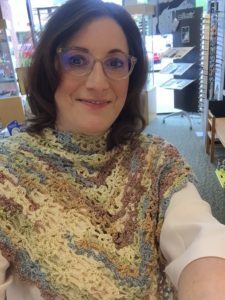 Trying on the shawl after using up half my yarn. Finished shawl. The yarn is Classic Elite Summer Sox, superwash merino, nylon and cotton. So “blocking” consisted of throwing it into the wash with the towels. Turned out great! close up of the stitches. Working on Part 2 of You Tube video with Marly Bird. 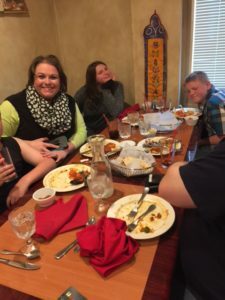 Having dinner with the wonderful Bird family!